Deceptive Representations By New York Public Library On Its Central Library Plan: We’re NOT Shrinking Library Space, We Are Making MORE Library Space! It does seem as if more and more often the perfunctory and somehow now acceptable public relations ploy for public officials with an objectionable or weak narrative they want to peddle to the public is to simply declare that they are doing the opposite of what they are actually doing and see if anyone notices. Does Bloomberg’s Mid-town rezoning proposal, almost doubling the density of Manhattan around Grand Central Terminal, raise the specter of absolutely unbearable congestion? : Sell the idea as a plan intended to relieve the congestion the public already perceives as oppressive! So it is when the New York Public Library schemes to sell off library real estate. (We are speaking of the NYPL’s Central Library Plan, “CLP”.) If you sell off your library real estate you are going to have less library space to serve the public. That’s something the public isn’t going to like to hear. Right? Solution? : Simply tell the public that shrinking library real estate way down actually amounts to increasing it! How completely does the NYPL indulge in this reverse logic game? Let’s first review how much library real estate the CLP discards as it shrinks library space and then consider how the NYPL depicts it all as an increase. The consolidating shrinkage of the Central Library Plan involves taking about 380,000 square feet of library space and shrinking it down to 80,000 square feet. Two libraries, together constituting about 300,000 square feet of space, the Mid-Manhattan (about 139,000 sq ft), and SIBL, the Science Industry and Business Library (160,000 sq ft), will be sold off. In addition, in a further loss of space, the research stacks (80,000 sq ft*) underneath the Rose Reading Room of the 42nd Street Central Reference Library, serving that room, integrated into the room's function, and providing its structural support will be demolished, decommissioning the Central Reference Library as the world-class institution it was designed to be. All of what was in the 300,000 sq ft space of the two sold-off libraries will then be squeezed into the space where the irreplaceable research stacks will have been destroyed at enormous cost to the public. Astoundingly, it will be accessed through one small door and that perhaps says something dispiriting about how library officials really do view this as a significantly reduced space. As recently as 2003, when growth plans were abruptly supplanted by shrinkage plans, it was proposed that Mid-Manhattan be almost doubled by adding 117,000 additional sq ft to it. Indeed, there is good reason to argue that Mid-Manhattan should have been increased by an even greater amount than planned in 2003 because, in 2007, when it was announced that the former Donnell Library was being closed for shrinkage the public was assured that one of the reasons it needn’t regret the space disappearing from Donnell was that many of that library’s functions and collections were being transferred to Mid-Manhattan! Statements in which library officials (and Mayor Bloomberg) assert that they are increasing library space rather than shrinking it. Space is space and inherently valuable, so the only way in which to describe a space reduction as an increase in space is to side-step an apples-to-apples comparison of space by substituting other contrived measures of evaluation; for example being oblivious to that fact libraries are far more than what Mr. Offensend might selectively characterize as space that is “publicly open” and oblivious to how the NYPL is getting ride of books and librarians, themselves significant assets that are part of properly serving the public. This contrarian idea of describing significantly “smaller” as greatly “bigger” so as to confuse the public isn’t new. 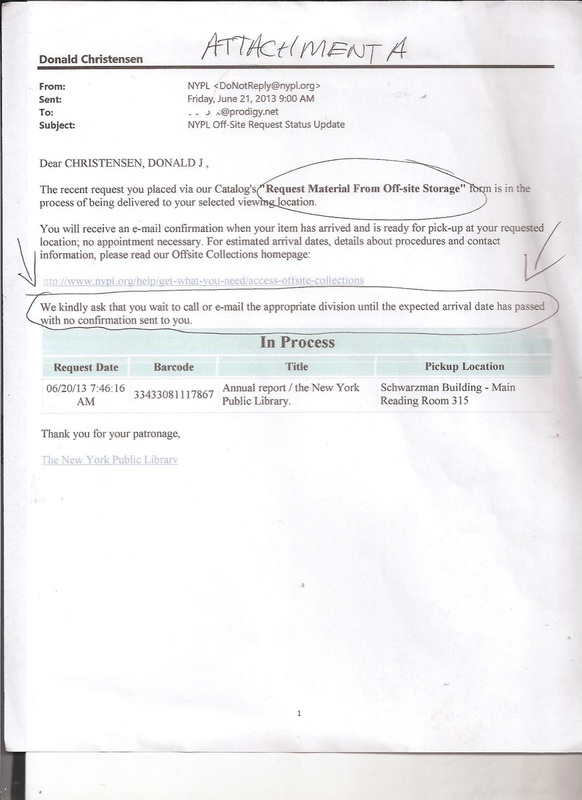 It may be a reason why the public and the press accepting statements from the NYPL at face value haven’t raised the extraordinary outcry you would expect in reaction to plans to cast off these irreplaceable assets and crown jewels of the library system. That’s the “big type”! If you diligently read the small print you will find that you are even more reassuringly told (emphasis supplied) that: “The plan will more that double public space at 42nd Street by converting an area the size of seven football fields— the closed book stacks — into a lending library and other educational spaces.” . .. Note how easily the ambiguity of the word “closed” allows the reader to mistakenly infer that the research stacks are no longer used and no longer have function. “Seven football fields”? That's clearly a reference to the square footage of the seven floors of research stacks that will be torn out given the telltale “seven” reference, but it is an inaccurate and a misleading statement in several respects, the most significant being that the square footage of the space planned to replace the stacks (80,000 square feet) will be only 39% more than the size of one football field, an American football field being 57,600 square feet. But the idea that there are “seven football fields” of stack space to be converted is balderdash in that each floor of the stacks is only about 23,000 square feet, far less than half an American Football field, with the entire seven floors of that space adding up to only only about 162,000 square feet. That's fewer than three American football fields. Soccer, rugby and virtually every other kind of football fields are bigger than an American football field which would throw the NYPL's calculations even more wildly off. Does anyone want to bet that when the NYPL does its space calculations it switches over to measurements of cubic square feet whenever that boosts its exaggerations? A sectional view of the research stacks as they appeared on the cover of "Scientific American". “Seven football fields” of claimable space per the NYPL? Hardly. Around the bend you will discover other NYPL visuals that deceptively misrepresent the volumes of space being reshuffled and severely contracted as the NYPL discards is assets selling off real estate, somehow, counter-intuitively, at a probable net financial loss that is being downplayed. Above you see the `explanatory’ canvasses at the 42nd Street Central Reference Library and below you see a version of the same NYPL-supplied visual picked up in a Library Journal article about the two lawsuits recently filed to block the demolition of research stacks that would ruin the function of the Central Reference Library. (See: Second Suit Filed to Halt NYPL Central Renovation, by Meredith Schwartz, July 11, 2013.) Observe that Library Journal simply reproduces the NYPL image without noting any of its oddities. The NYPL promulgated visual above is startling in the way that it deceptively misrepresents what the NYPL is proposing to do in terms of shrinking down library space (which is one of the reasons the NYPL is getting rid of books). 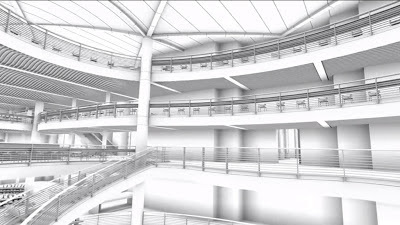 The Science, Industry and Business Library (SIBL) is diagrammed as if it is the smallest of the spaces they are dealing with. It is actually the largest of the library spaces at 160,000 sq ft. Mid-Manhattan at about 140,000 sq ft is the second largest although it is made to look about the same size as the representation of the 80,000 sq ft of space where the research stacks are now that would be ripped out. 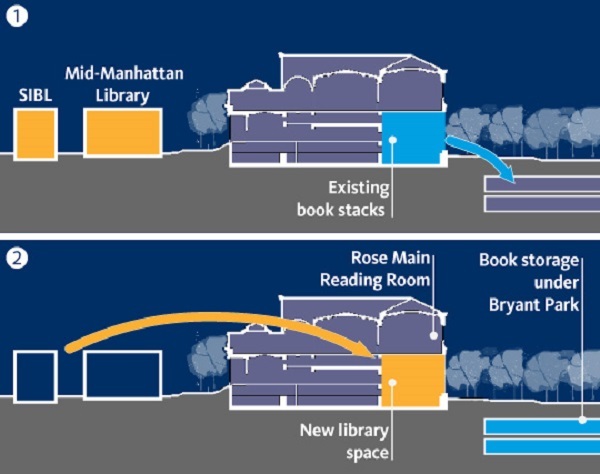 Even though, bottom line, 380,000 square feet of library space is being shrunk down to just that 80,000 sq ft (to be accessed through only one small door way in the back of the building), the diagram almost makes it look like it could all fit without throwing away the books they are throwing out. Also, just looking at the diagram and not reading what it says you might think that Central Reference Library books are not being moved off-site to Princeton, New Jersey and/or elsewhere. And you might think that the stack space under Bryant Park is not already being used, that it did not previously exist, nor that it had the intended purpose of also covering future expansion which it will, under this plan, no longer be able to do. It would be incorrect to suppose any of the above. This silliness is replicated in an even more forcefully misleading way, in a video animation inserted in a five-minute NYPL-produced film that plays on a loop in the 42nd Street building’s lobby and is available on its web site: “A First Look at NYPL's Central Library Plan.” I have made just the animation segment available in the video below. If the spacial relations were more correctly depicted it would look like this. Or wouldn’t it be better to better to depict the entire before and after this way? The NYPL was not alone in making the misrepresentation to the public that what was going on was a seeming increase to the supply of publicly owned library space with the building of libraries bigger than had ever been previously seen. Mayor Bloomberg has done the same thing. They must be conferring on strategy. In midtown, we’re helping the New York Public Library build the largest circulating and research library in the world. Bloomberg was not telling the public that the new large midtown library was intended to consist of the shrunken remnants of Manhattan’s formerly great libraries: Mid-Manhattan, SIBL, the Donnell Library (shrunk from 97,000 square feet to 28,000 square feet) and the world-renowned Central Reference Library. Nor was Bloomberg saying that it was already announced that the program of sale and shrinkage of libraries was being exported to Brooklyn with the intended sale of the Brooklyn Heights and Pacific Branch libraries, and others yet unspecified in line afterward, and with a consolidating cramming of space that will affect Brooklyn’s main library at Grand Army Plaza. Maybe there are possible arguments for smaller libraries but usage of New York City libraries is way up, 40% programmatically and 59% in terms of circulation. Demand for physical books is up and a new Pew Study tells us that our modern age youth are far from ready to give up their physical books: American Youth Read Books in Print (For Now), by Aron Chilewich, June 26, 2013. If smaller libraries really are truly better wouldn’t library officials be telling us that? To an extent they might actually be endeavoring to do that, quibbling a bit bout the space calculations, speaking in terms of equivalent space, usable space, “found” space and the “flexibility” of replacement space built without fixed walls. See: Friday, May 24, 2013, Previews Of The Proposed New Donnell Library: The NYPL Unveils Its Version Of The “Silk Purse” Libraries It Envisions For Our Future and Thursday, April 25, 2013, Building a “Murphy Library”. The bleacher/stairs can be used to show people David Niven movies in the daylight- Go to NNY's earlier article to see, with picture, what Ronald Reagan film probably ought to be shown. If you look at the picture carefully you see some odd things. Movie playing on the wall. Musicians playing in the corner and a person speaking in front of them. Another commenting reader cites several reasons he/she doesn’t think David Niven would approve of the perhaps hazardous design. But, in point of fact, we know that the truth of the matter is that smaller libraries aren’t better. We know this because if library administration and city officials really thought this was true they wouldn’t be spending so much time making the opposite case, that big is better, going out of their way to tell us how they are building bigger libraries when they actually aren’t. In that spirit I conclude this post with some AT&T “It's Not Complicated” `bigger is better’ commercials, because you know what? It’s true: It isn’t complicated. AT&T TV Commercial - It's Not Complicated "Tree House"
When (If?) The Mid-Manhattan Library Is Ultimately Sold As Part Of NYPL’s Central Library Plan, How Big A Building Would Replace It? 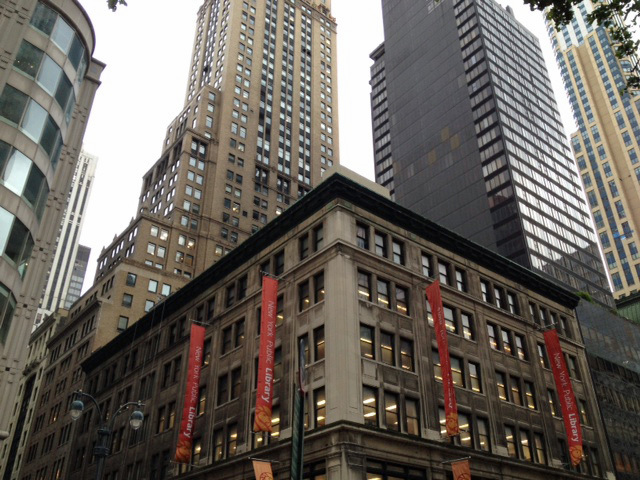 Mid-Manhattan Library and behind it 10 East 40th Street on left and 445 Fifth Avenue on right. Would these three buildings be torn down to put up a very much larger building? As people should know by now, an important part of the New York Public Library’s Central Library Plan (CLP) is the sale of its very heavily used Mid-Manhattan Library. In fact, there is plenty of reason to suspect that a goal of selling off that building may be the main reason that the NYPL is pursuing the CLP. We’ll come back to that momentarily. If the CLP goes through and the Mid-Manhattan library is sold, how big would the building be that replaces it? Testimony delivered by Don Christensen at Assemblyman Micah Kellner’s June 27, 2013 hearing on the sale of New York City public libraries provided information and grounds for analysis to strongly suspect that 10 East 40th Street, the building directly adjacent to the Mid-Manhattan building to the east, is likely to be torn down and its lot combined with Mid-Manhattan’s to build something very big. 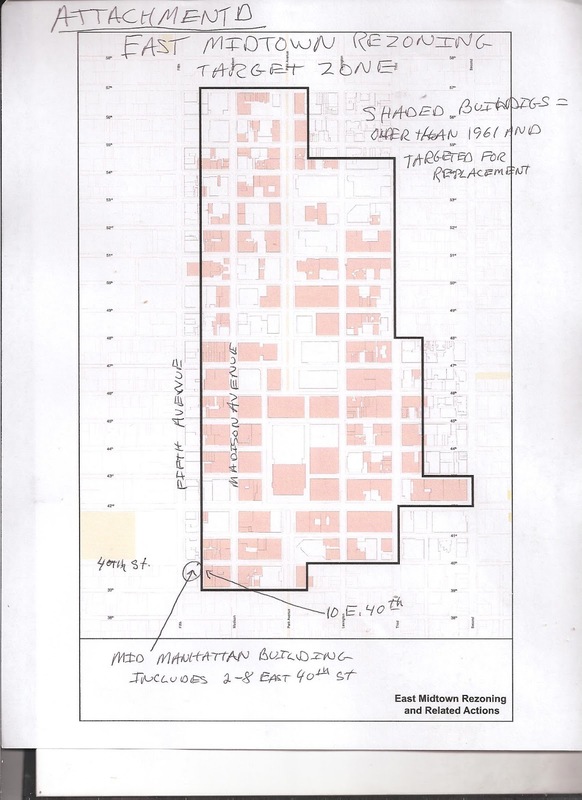 As Mr. Chistensen pointed out, 10 East 40th Street is one of the “shaded buildings” on the Mid-Town Rezoning map “built prior to 1961 and . . particularly targeted for replacement with more modern and taller buildings.” The map Mr. Chistensen provided with his testimony appears below. 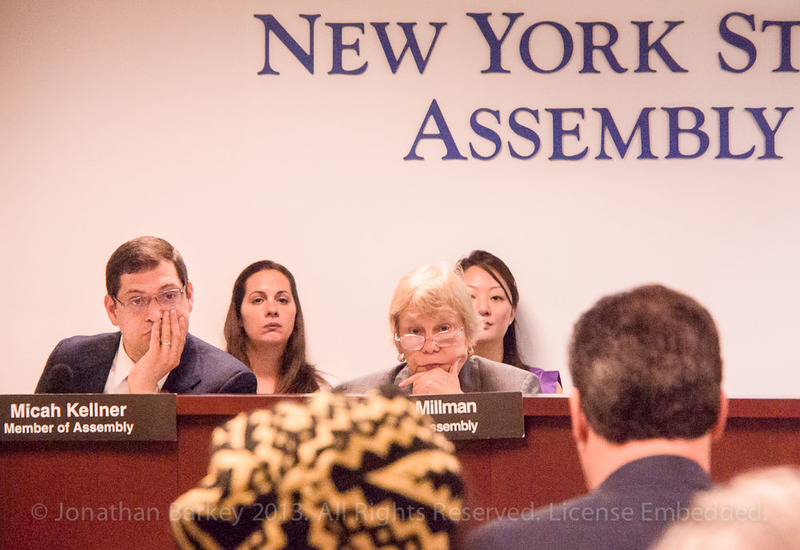 See: Tuesday, July 2, 2013, Startling Testimony at State Assembly Hearing on NYC Library Sales. 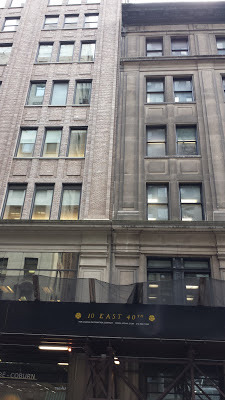 Noticing New York included information and grounds for analysis to strongly suspect that another building next to the Mid-Manhattan Library, 445 Fifth Avenue, immediately adjacent to the south, would also be torn down and combined with the Mid-Manhattan site. 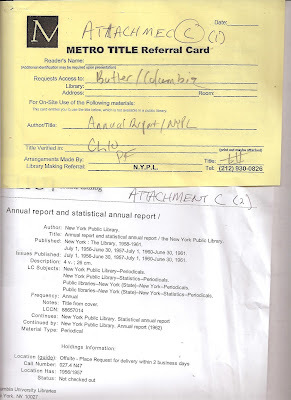 See: Saturday, June 15, 2013, SIBL, NYPL's Science, Industry and Business Library Sold At An Unreported Loss To The Public (And an Elucidating Sideways Look At The BAM South Library Real Estate Games). Again, Mid-Manhattan Library and behind it 10 East 40th Street on left and 445 Fifth Avenue on right- Click to enlarge? • The NYPL will have reduced the space of two major libraries of significant stature, Mid-Manhattan and the Science, Industry and Business Library, representing an aggregate of about 300,000 square feet of library space, and squeeze the those two libraries into just 80,000 square feet in the back quarters of what has hitherto been the 42nd Street Central Reference Library, a world-class institution. 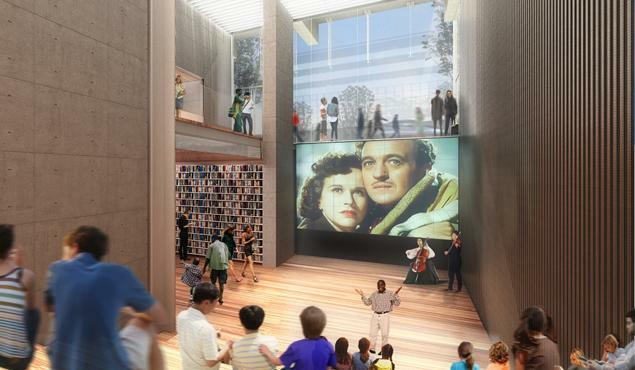 • In that process another 80,000 square feet of space will be sacrificed and lost, the fabled research stacks of the Central Reference Library, an integral part of the building’s Carrère and Hastings design, structure and function. 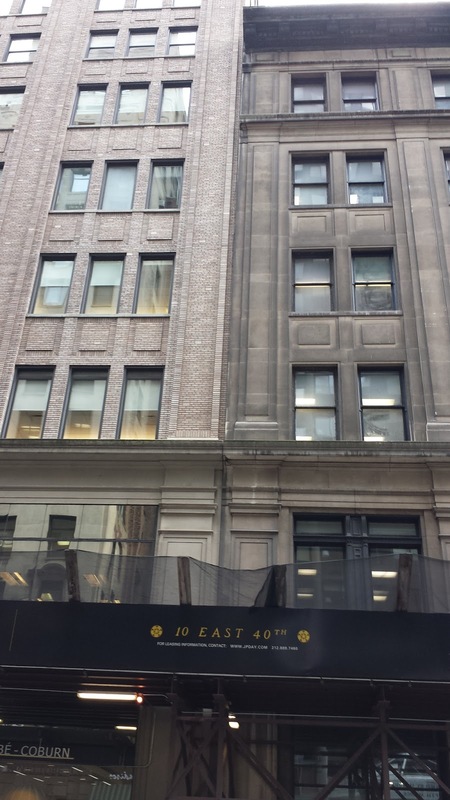 • As Mr. Christensen's testimony also pointed out, the entirety of the space that is intended to replace the Mid-Manhattan and the Science, Industry and Business libraries will be accessed through one small door deep within the 42nd Street building. • the previous plan for Mid-Manhattan, last in effect in 2003, called for almost doubling its size by adding another 117,000 square feet. • Much of the research collection of the Central Reference Library will become highly inaccessible as it is moved to storage in Princeton, New Jersey. • The circulating and reference collections of Mid-Manhattan and the Science, Industry and Business Library will also be banished and, if kept at all, will become relatively inaccessible because the only way to shrink the two large libraries into such small space is to get rid of books and librarians. That is why the NYPL is so busy working hard to get rid of books in preparation for the envisioned move. All of this will be done at enormous cost, effort and years of construction. The plan has still not yet been completely designed or finally costed out, but it is expected to run at least $350 million in public money, of which at least $150 million will be taxpayer dollars, altogether a likely a net negative for the NYPL after selling its real estate. Would anyone care to guess whether $425 million is actually the more likely neighborhood of the figure that these total expenses come in at? The CLP was conceived in 2006, perhaps 2005, according to NYPL Chief Operating Officer David Offensend. It won’t be completed until at least 2018. Are these things ever completed on schedule or on budget? The deal will probably be a “stop-watch deal” (with the NYPL selling Mid-Manhattan only after completion of the CLP construction) so the condition of the real estate market and what Mid-Manhattan can eventually be sold for, the ultimately likely loss to the NYPL, will not be known for years. And what will be the ultimate benefit for the NYPL of all this shrinkage and reduction of resources at such enormous expense? : Running much smaller shrunken-down library space with fewer librarians and fewer books will cost less to operate. . . .
. . . Really? Why go through such gyrations to achieve a purpose that is essentially antithetical to providing library services? With money that could have been used to provide library services? There really is no reason to be jumping through all these hoops, mobilizing such terrific energy, spending all these public and taxpayer dollars for such a stupid result. That’s what ultimately causes us to infer, of necessity, that the building that replaces Mid-Manhattan is going to be a very, very big building. Something must be fueling all this silliness. What else could it be? This Noticing New York post will do something unprecedented: I will turn over most of what you will be reading here to someone else's voice: the startling hearing testimony of researcher Donald Christensen. I doubt that you will be disappointed! I'd like to think that, even if readers will be reading work authored by another, they will feel as if they they are reading one of Noticing New York's better articles. I hesitate to make that assertion because you might think I am trying to flatter myself: The insights, research upon which they are based, and the way everything is expressed in what you will be reading is superb. Last Thursday, June 27, 2013, Assembly Member Micah Kellner, Chair of the Committee on Libraries and Education Technology, held a public hearing at 250 Broadway in Manhattan on the sale of New York City library buildings to private developers. The better part of what you be reading constituting this post is the stunning testimony delivered at that hearing by Donald Christensen, a professional researcher. Overall, between 50 to 60 people signed up to testify. Though the room was filled to capacity (about 130 people were there) with every seat taken, not all of those who signed up to testify made it to the hearing and some who made it to the hearing to testify were not able to wait until the end of the day to deliver their testimony orally (though they were able to submit their testimony in writing): The hearing, scheduled for 10:30 AM, got underway before 11:00 AM and lasted until just after 6:00 PM. Other than the library heads, Anthony W. Marx, president of the New York Public Library, and Linda E. Johnson, president of the Brooklyn Public Library, nobody who spoke on Thursday spoke in favor of selling the libraries. 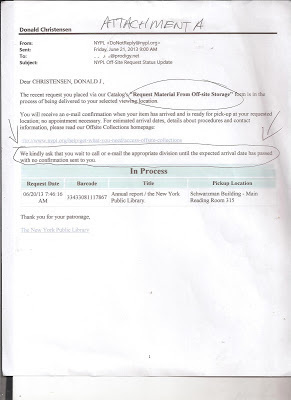 A most detailed account of the hearing from Susan Bernofsky can be found here: Friday, June 28, 2013, Saving the New York Public Library. Video of it is now up on the Assembly’s website where a transcript will also be supplied. The best news for opponents of the library sales was that the Times coverage, by Robin Pogrebin and prominently featured in Friday’s main art section (see above), raises the hope that these issues are beginning to get the kind of coverage they deserve. Recently, Times reporter Joseph Berger worked mention of Citizens Defending Libraries (and accompanying link) into an updating story about the improved prospects for survival of the Pacific Branch library (Berger has also tracked the fate of libraries in an updating story about school sales were thwarted by community opposition). That mention was a helpful adjustment for the fact that reference to Citizens Defending Libraries had been removed from the earlier Times front page story about city libraries and schools being sold. 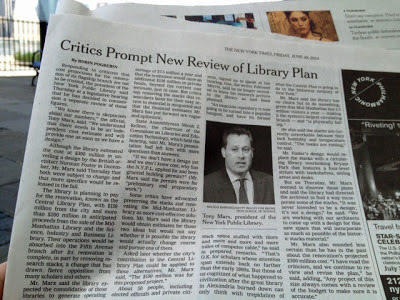 Ms. Progrebin’s latest article didn’t refer specifically to Citizens Defending Libraries but its theme was how NYPL president Marx has needed to retreat in the face of questions about why the NYPL was proceeding with an obviously very expensive Central Library Plan when it did not yet have a design or cost calculations. See: Critics Prompt New Review of Library Plan, June 27, 2013. The math in Marx's statements about how he was calculating that there was public benefit to the CLP also did not seem to work out unless one ignores and does not treat enormous taxpayer expenditures ($150 million) as being an expense. In my testimony, which followed President Marx's, I offered to comment on Mr. Marx's remarks but that didn't happen, given time constraints and the long list of those signed up to speak next. • The NYPL will "use more of the historic stack materials in the new design" to "memorialize what they look like"
• "People have expressed concern about how people will travel through the building" and accommodation of the larger number of people the NYPL has spent time "designing what the architects call the circulation, meaning how people move around and through the building" with "considerably more square footage open to the public. . so we are working hard on that"
• Signage and wayfinding, ways to improve the visitor experience. • The NYPL, as of September, "agreed to a build out a portion of the Bryant Park stack to maintain many more books on site"
When we get to Mr. Christensen's testimony, remember the points above about the flow of pedestrians and crowds through the building and signage, wayfinding and visitor experience. During his June 27th hearing testimony Marx also mentioned the accommodation to critics of building out the stacks under Bryant Park (this was actually the first of the items when Offensend `ticked' off his list). The problem was that at the same meeting where Offensend cited this as being a revision to the plan in response to public comment he contradicted himself with an earlier statement describing the build-out as being part of the original plan. And the librarians were like, well, `we'd have to figure out where to put the books.' And we did have that second level underneath Bryant Park, and we did calculate that, fully built out, it could accommodate about the same number of stacks that were in the stacks. So that was part of the original plan. The librarians were very excited about it because they said that nobody uses those books very much, anyway. 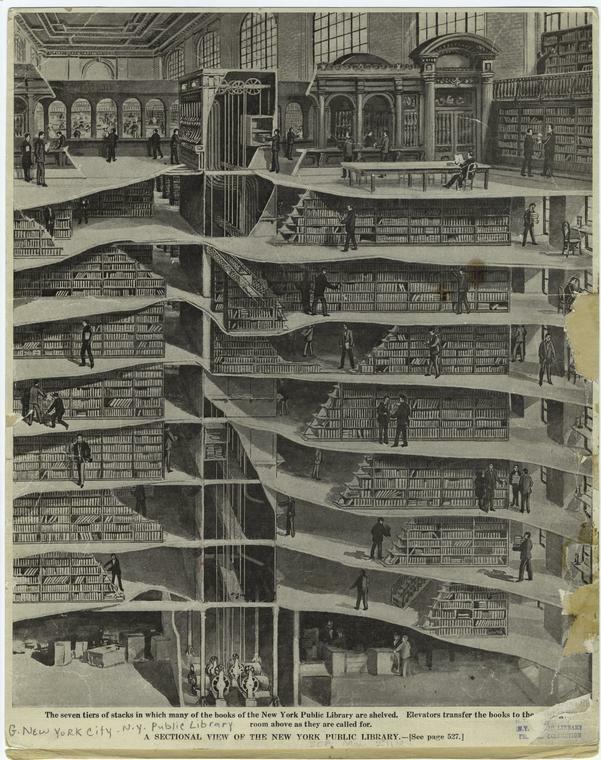 So was building out the stacks actually part of the original plan or one of the NYPL's very few ostensible responses to public feedback? I offer the above Offensend quotes without endorsement of whether I think the information stated in them is true, only to note the information given and the contradictions. 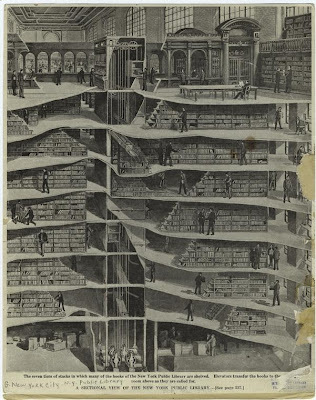 The other problem with building out the supplemental stacks under Bryant Park now in order to accommodate more books is that use of those stacks was always, for decades, the plan to accommodate future growth and needs, not present ones. It was supposed to accommodate at least another ten years of future need. . . .
. . . One other thing that COO David Offensend conceded at our May 30th meeting with him was that if the NYPL's calculations about space needs were incorrect, or if with growth in the future the consolidated Central Libray Plan library needed to be expanded, there was no capacity to accommodate such expansion. Had I continued my testimony at the hearing, I would have pointed out that the NYPL's lack of response to public reaction, together with Tony Marx's math that seems to assume that taxpayer dollars spent on the CLP don't have to be calculated as a cost in any cost benefit analysis, indicate a disdain for the public. Rather similarly, in Brooklyn, the Brooklyn Public Library does not wish to accept Citizens Defending Libraries as a representative of the public while the "Friends" of the library group has been given a lead role on the Brooklyn Heights Library "Community Advisory Committee" to represent the community even when that "Friends" group apparently believes it is never allowed to disagree or take issue with the BPL. Testimony from all the following elected officials was all highly critical of the library real estate deals: City Council members Tish James and Steve Levin, State Senator Velmanette Montgomery, State Senator Bill Perkins (by his representative, Michael Henry Adams). Those Assembly Members asking the library heads for information, including Kellner and Millman, were also highly skeptical of the planned sales. BPL's Linda Johnson seemed to attempt a friendly conversation with Councilman Levin out by the elevators right before he went in to testify critically about the BPL’s sales. Word is that the BPL's Linda Johnson was morose and cranky as she rode down in the elevator leaving the hearing, complaining about all the opposition to her planned library sales. She was headed for a meeting of the BPL trustees later that evening. There at that 5:30 PM meeting she was greeted by community activists who held up signs about saving the Pacific Branch. They stayed for most of the trustees meeting, but, according to the reports I received, unless Ms. Johnson saved her remarks for the very end, she never acknowledged the activists present, nor told the trustees anything about that day’s hearing. While the Times picked out the testimony of Edmund Morris, the Pulitzer Prize and National Book Award-winning writer and biographer of Theodore Roosevelt, who testified early in the day, as being of exceptional interest, as indeed it was, there was superb testimony throughout the day and you had to wait until the very end to hear some of the best of it, including Mr. Christensen’s. Mr. Christensen was on one of the very last panels with former librarian Rita Bott who also provided some especially insightful testimony that I should perhaps publish in another follow-up. A coincidence: It turned out that, as a librarian, Ms. Bott had assisted Mr. Christiansen with research years ago but they had never formally met. Because the testimony from Mr. Christensen that follows below is as long as it is I have not observed the usual Noticing New York convention of indenting to indicate that the text appearing is supplied by someone else. Also, to assist the reader with some "wayfinding" guideposts I have myself provided some subheading interjected between soem of the paragraphs. Here then, without further ado, is the testimony (video available at CDL's YouTube Channel) Mr. Christensen presented. Thank you for this opportunity to provide information I have concerning the topic of this public hearing. This hearing serves as a unique platform to create a public record of the facts, concerns and probable impact of the library's radical plans for reducing ready access to the library's resources for members of the public that the charter of the library promises to serve. Perhaps this public record will be reviewed by the people who are orchestrating this radical - and destructive - plan because until today there has been virtually no input allowed from anyone outside the small cadre of people intent on a singular agenda that has little to do with the goals that until recently guided this once-great institution. To prepare for today's testimony I read through the papers of the former Director of the library during the years of the formation of the Mid-Manhattan Library as it exists today at 40th Street and Fifth Avenue. His name was John Mackenzie Cory. He was on the staff of the library from the early 1950s until the late 1970s. All of his papers covering the transformation of the Mid-Manhattan building from the department store known as Arnold Constable are preserved in a large file box in the manuscript department of the Main Library building. That collection of papers includes all the correspondence, personal memos of everything from telephone conversations to notes gathered at lunch meetings, copies of internal reports from various Trustee committees, copies of legal interpretations concerning the Mid-Manhattan property as a real estate investment as well as various "white papers" and "confidential reports" that define the sequence of events and thoughts that show the path for the development of that facility. The records of Directors of the Library are sealed from public view for 20 years. That means we won't be able to access such records of the current director and those of the recent past to find out exactly what they have been up to for another 20 years, in which case it might be too late. But we have Mr. Cory's papers and they reveal a lot. I also had the opportunity to review the minutes of the Branch Library Council, which oversees a part of the actions of the branch libraries, including Mid-Manhattan, from the years 1949 through 2002. Those minutes and the other papers in the Branch Library Council file box at the manuscript department also reveal some interesting things. While I went through these papers I took copious notes and had copies made of salient documents. Unfortunately, I cannot share with you copies of those documents. 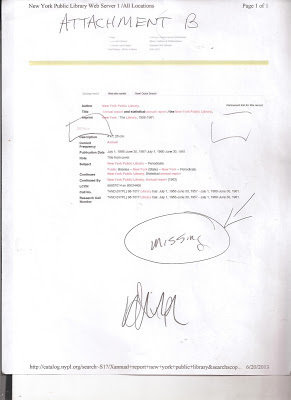 I have them with me, but I cannot copy them or quote from them for any type of publication (including the 20 copies of this testimony) without permission of the library. I have not been able to secure permissions. So I will have to paraphrase what I found in those papers. There are two basic issues I'd like to cover today in the short amount of time I have. First, the goals and intentions of the Mid-Manhattan library as defined by the people of John Mckenzie Cory's era in comparison to what the current regime wants to deliver to the people of New York. Second, to look at the Mid-Manhattan property as piece of real estate. As everyone in this room knows, this whole current plan is really a real estate story, apparently designed to make someone really, really rich while impoverishing the cultural and intellectual texture of the city of New York. First, why Mid-Manhattan was developed. Since the late 1940s the Library wanted to move the small circulating facility out of the main building so that the main building could concentrate on the research aspect of the library that was the basis of its formation as opposed to the goals of the branch libraries. They first considered other ways of expanding the space within the main library. For example, there was a plan drawn up to tunnel under the terraces surrounding the building. That plan was scratched because they wanted a general circulating/general research library that was both visible and easily accessible. They did not want to hide it within the marble fortress of the Main Library. Also, they wanted a facility at a location nearby the main building. The idea was that if someone's research need was beyond the resources of a general research library, a patron could readily be sent to the main library and have their research needs handled immediately. In 1961, the building housing the Arnold Constable department store came on the market. The department store did not own the building and never had. The store was just a tenant and in 1961 they had a lease that would not expire until 1979. Still, the library bought the building with the specific intention of taking over the building in 1979. The department store went out of business in 1975 and vacated the building. In 1967 the department store vacated the top three floors of the building and the first manifestation of the Mid Manhattan library branch opened on those top three floors in 1971. After the department store completely vacated the building, a series of recommendations were made about how to use the space. There was a lot of pressure to rent out the first floor for commercial use to get money to run the library. But a stronger faction within the library argued that such a thing would go against the goal of making the library fully visible from the street and readily accessible right off the sidewalk. To make it even more inviting they increased the size of the window on the façade of the building so that people could see in and see that it was a welcoming place to enter. Another option that was rejected was the possibility of purchasing the Columbia University Club building on West 43rd Street, which was on the market for a time prior to the full expansion into Constable building. That option was rejected because the 43rd Street location was not visible enough. After the commitment to the Mid-Manhattan along with its street level openness and easy accessibility, millions of visitors found that the concept has been very successful. But now we are faced with a different idea. This idea strives to hide the general library deep in the bowels of a formidable building behind three massive walls of marble and far, far away from ready access from the street. This idea more closely matches the idea of burrowing under the terraces that an earlier - and wiser - generation of library leaders rejected as inappropriate for serving the general public. And how will this hidden facility welcome people into it or even let people know it is there? I doubt very much that they will put a sign over Stephen Schwarzman's name on the building to tell people what they might find inside. As far as accessibility goes, this plan is a nightmare. I counted how many stairs and how many strides it would take to get to that location. 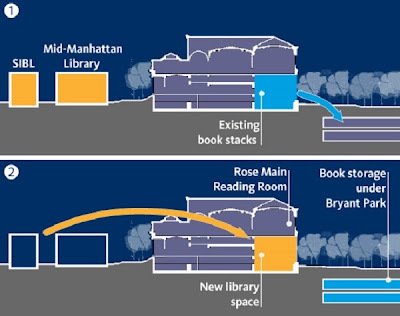 Now, I might point out, it takes about 10 strides at the Mid-Manhattan library to get from the street into the actual library space - and it's on one level. In contrast, you have to climb 29 stairs and you have to take 62 strides to get from the sidewalk to the first door of the building's entrance. Then you have to take another 88 strides to get from the first door, traveling through two more doors to finally get to the top of Sir Norman Foster's flamboyant and vulgar staircase to look up at a seven-story high empty atrium and then climb down more stairs to reach the main level of the so-called library. It would take half a day to get to and from that space and only if you are in good shape. But before you could get to Sir Norman's atrium, you would be forced to pass through one small door to get into what is now the Gottsman exhibition space and then through another small door at the other end of the Gottsman space before finally getting to Sir Norman's staircase when to begin your descent. Those two small doors supposedly are to serve both as the ingress and egress to and from the atrium space. At the Mid-Manhattan building, in contrast, there are three doors to enter and in different locations there are five doors to exit. And even then there are sometimes lines to get in or out. But Sir Norman's design doesn't take such traffic flow into consideration. Maybe Sir Norman doesn't know what it takes to get a million people a year in and out of a building space if there is only one door for both paths of action. The library has produced a video* that shows how easy it would be to get to the Sir Norman's atrium by seeming to show you floating through these little doors like Peter Pan with no other people around and no obstructions. In reality, it would more likely look like the army of cards in Alice in Wonderland slamming up against each other to get through the White Rabbit's little door. I can imagine that Sir Norman doesn't have to worry about crowds of ingress and egress when he visits the library building because I'm sure he is gestured in with: "After you, Sir Norman." When I look at the lack of doors to accommodate any reasonable type of ingress and egress flow of people, I notice that there are spaces at the rear wall of the Astor Hall that separates the Hall from the Gottesman Exhibition Hall that could be knocked out and more doors put in. Although the Astor Hall has an interior landmark status, I understand that the landmark definition does not extend to that back wall. I wonder if the current leaders of the library and Sir Norman would have any problem with knocking out portions of that wall - and vandalizing that space -- once they realize that people couldn't all get in and out of the single small door that is there now? Certainly, the distance from the sidewalk to Sir Norman's atrium would be an insurmountable expedition for a lot of people who currently use the Mid-Manhattan location with ease. And that doesn't even begin to address the needs of disabled people. Will people in wheelchairs be sent on an excursion to 42nd Street and up and down ramps and elevators instead of simply traveling directly off the street like they do now at Mid-Manhattan. Maybe the library could have Sir Norman design a sign to hang out front to express what they might really mean with this obstacle path for disabled people: "No cripples wanted." (Added by NNY 7/4/'13) On left: Reality, light traffic through first door. On right: NYPL Architectural rendering of second door, and only entrance to the space meant to replace two large libraries - Is that couple conveniently diminutive?- Click to enlarge. 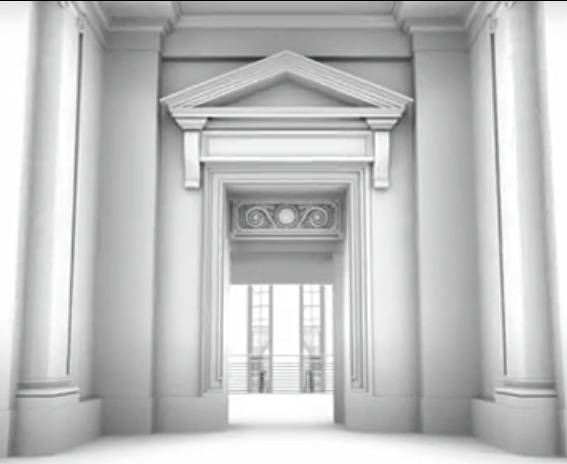 (Added by NNY 7/4/'13) NYPL rendering from the inside showing the one small single door entrance. In short, what we are getting here is the closure of a completely open democratic space and in its place we're getting a hard-to-get-to and hard-to-access area that's really designed to keep people out for elitist use by people who have the time to get there and the knowledge of where it's hidden. And let's be frank here, who could look at that huge atrium space and not see it for what it really is: A dramatic party room to be used occasionally by a handful of rich people. All fully equipped with a Sir Norman staircase to enter onto and sashay down so that party goers gathered below can admire the clothes of other rich people. And, by the way, why couldn't the library leadership find an American architect? After all, the trustees of the original building were able to find American architects. But I guess it's less fun to say "I'm taking the B train to Union Square to meet with the architects" than to say "I have to go to London to meet with Sir Norman." This whole Sir Norman dynamic sums up the elitist tone of this entire Central Plan. This new space isn't for the little people. It just another club room for today's moneyed oligarchs, their avatars and sycophants. And to claim that the traditional use of the Main Library as a superb research center has been maintained even though most of the books have been moved elsewhere - like New Jersey - is a total lie. While I have used that research library for over 30 years, my recent experience shows exactly how wrong-headed and dangerous this method is proving to be. When you go to the main library, you don't know what materials are on-site or off-site. The on-line catalog accessible via the internet at home is of little help. You can try to order off-site materials via the internet, but the library cannot promise when the materials will be ready to be examined. In fact, if you ask for them to arrive on a certain date, you cannot ask whether or not they will be there until AFTER the date is passed! (See ATTACHMENT A.) In addition, because there is no librarian to assist you in navigating through the search process, you are often sent the wrong materials. Moreover, a lot of materials have already been lost. 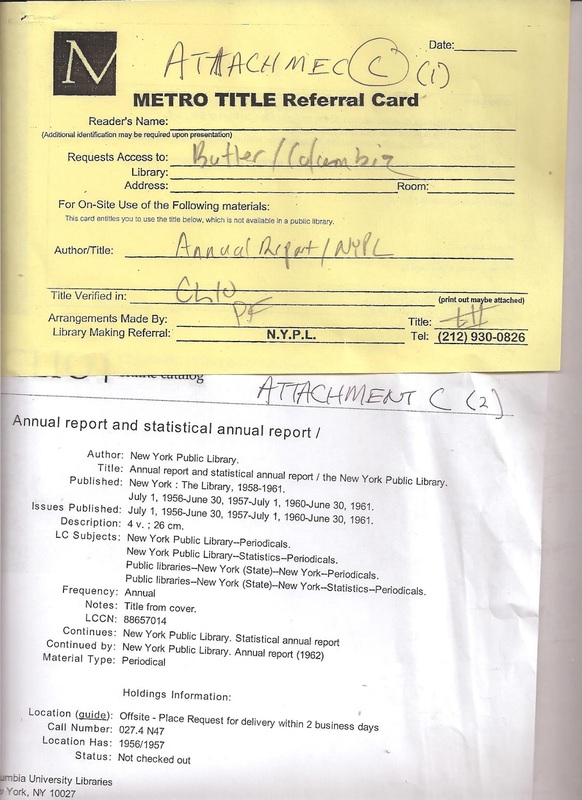 For example, I wanted to look at the New York Public Library's Annual Reports from 1958 through 1962 to see what was said about the purchase of the building that is today Mid-Manhattan. Well, those volumes have been lost. (See ATTACHMENT B.) I had to be sent to the Butler Library at Columbia University to look at them. 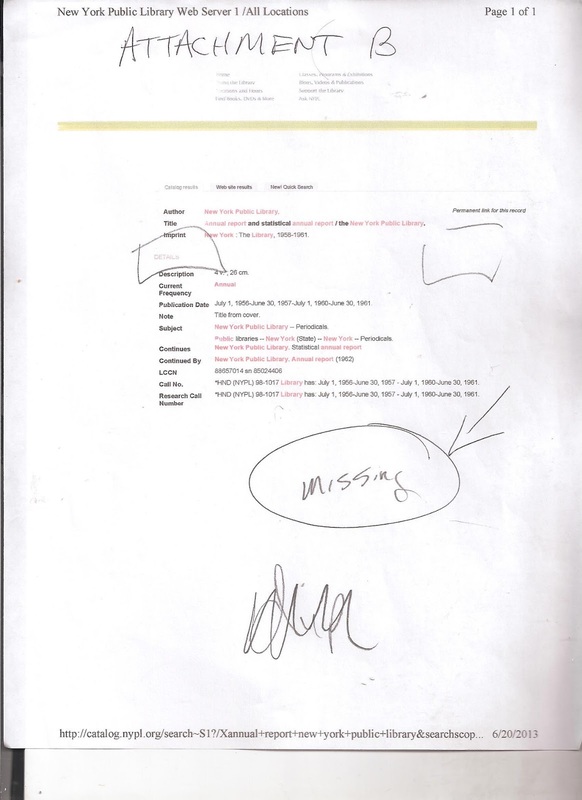 (See ATTACHMENT C.) The New York Public Library has LOST the documents of their own history. Tragically, it's not too surprising since the current leadership of the library apparently has total contempt for the treasures in their care as they throw these materials up and down the New Jersey Turnpike in a cavalier fashion. I can report with confidence that the librarians working at the Main Library are completely frustrated with this nonsensical system that will guarantee further deterioration of the collection as it travels back and forth from storage in another state instead of just traveling up and down on small elevators from the stacks. And why? Again so that a few rich people can have another dramatic party room? The successful and ideal profile of the existing Mid-Manhattan building as fulfilling the goals of being a visible, accessible, democratically welcoming center located right on the street compared to the hidden, inaccessible, elitist nature of the proposed plan to move within the Main Building butts up against the reality of the real estate of the Mid-Manhattan building. This prime property is ripe for development. But who would get it? Who is poised to make the big money with its ownership? But more importantly, why should the library give it up since, obviously, they could never be able to recapture such real estate if the nature of libraries changes again at some time in the future. Plus, considering the library's past failures in successfully getting good prices for the real estate they have already sold, why should they be trusted not to throw this one away as well? The unique placement of the Mid-Manhattan buidling finds it at the edge of the Bloomberg initative calling for the updating of buildings within what is called the East Midtown Rezoning Target Zone. Attached is a map of that area. 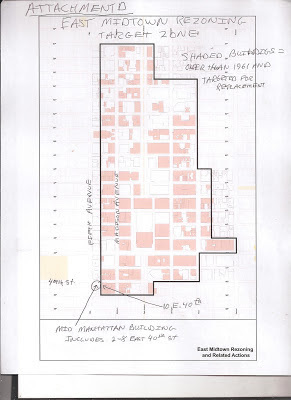 (See ATTACHMENT D.) Shown on the map are shaded buildings that were built prior to 1961 and are particularly targeted for replacement with more modern and taller buildings. You will see on this map that the building directly adjacent to the Mid-Manhattan building to the east is one of those shaded buildings - 10 East 40th Street. The Mid-Manhattan building occupies 2-8 East 40th Street. The library building itself is NOT within the Target Zone, but, again, the adjoining property is. 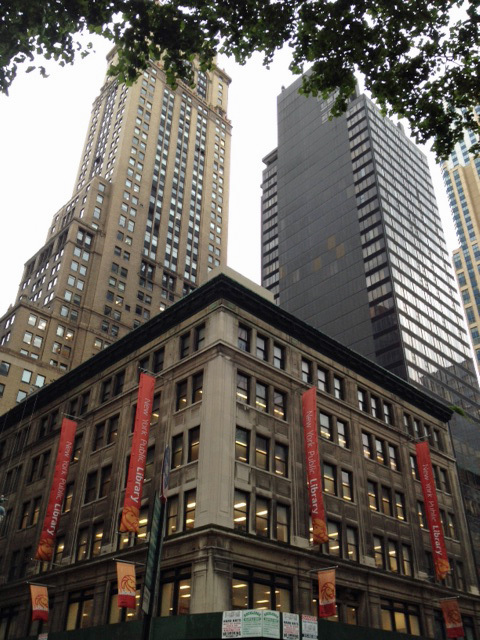 10 East 40th Street is owned by a group headed by real estate mogul Larry A. Wohl. 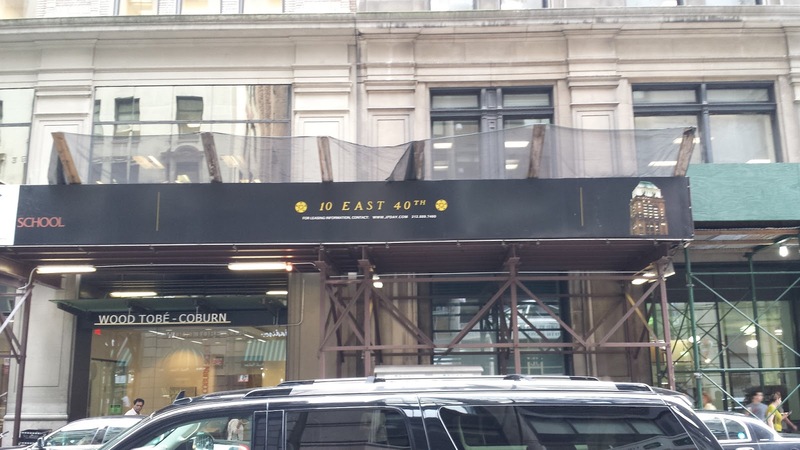 Wohl's father and Wohl's father's partner Norman Levy bought 10 East 40th in the mid 70s. The two buildings - the library building and 10 East 40th - has a long and complex interwoven history that is too complicated to get into here. The two buildings were built by the same man - Frederick Vanderbilt - who owned them until death in 1938. There are aspects of the two buildings that overlap. Because of this interwoven connection, Norman Levy and Wohl's father were in constant contact with John Mackenzie Cory and other library executives over one matter or another affecting both buildings. Then in the mid 1970s after the department store decided to vacate the building and before the commitment was made to fully develop the Mid-Manhattan branch, Levy and Wohl made a very generous offer to buy the building. This sent the library leaders to assess the situation seriously. They drew up an analysis of 6 options, including selling the building to Levy and Wohl. The library as well as the whole city was in dire financial straits at the time. But in the end the library leaders took the high road. They recognized that the building offered the best option for the goals they wanted to achieve to serve the needs of a general library. They turned down the purchase offer to follow the ideals of the institution - visibility and accessibility, no matter what the cost. Even though they didn't really have the money at the time. Has that observation of linking the two properties of Mid-Manhattan and 10 East 40 escaped the notice of the current leaders of the library? I doubt it. But, would they stick to the principles that their predecessors under the leadership of John Mackenzie Cory showed when they turned down an offer of ready cash from Wohl's father in order to fulfill the goals of the institution of reaching out to the users of the public library by having a space visible and easily accessible. Sadly, I doubt that as well. They'd rather have the hidden Sir Norman party room kept pristine by keeping people out through three barriers of marble walls and time-consuming journeys to keep it available only to people with a lot of time and cut out such groups as lunchtime users who now run quickly in and out of Mid-Manhattan. I don't know if Larry Wohl has maintained the type of constant contact with today's library leadership that his father and Norman Levy enjoyed with John Mackenzie Cory. We won't know for another 20 years when we will be able to examine the papers of Mr. Marx and his advisers. Wohl's Writing On The Wall? But the other day I got a little clue. Walking past the two buildings where they join on East 40th Street -I noticed that a large advertising sign for Mr. Wohl's leasing corporation, Joseph P. Day Realty, was announcing space for lease in 10 East 40th. The sign extends far into the side of the library building. (See ATTACHMENTS F and G.) This sign, in other words, encroaches on the library property, apparently with impunity. Is Mr. Wohl already assuming ownership of the library building? Are the leaders of the library already assuming that that will be the case? Is it much of a leap to imagine how much richer Wohl would become with control of that corner of real estate? And is it much of a leap to imagine how much less access the people of New York will have to library services as a result? As the library continues to give away its real estate to make others rich, the losers are the people of New York. 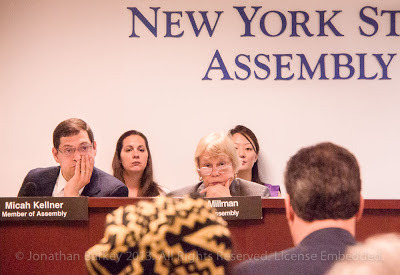 And that, dear friends of Noticing New York, is the startling testimony that was presented by professional researcher Donald Christensen at Micah Kellner's June 27, 2013 Assembly committee hearing about the sale of libraries in New York City. Video is below or, best way to see it, available at CDL's YouTube Channel.